Stunning Lake Oroville Area Home! This home located near Lake Oroville is fantastic in every way, you will pull up to this home and see the awesome curbside appearance, with over sized driveway leading to the large three car garage. The entry and front porch area is perfect for sitting and and lots of room for outdoor furniture here. Open the door to a tile entry leading to the large living room, with a gas fireplace, surround sound can lights and ceiling fan, nice built in cabinets for the formal dinning area with a door leading to the rear patio/deck area. The Kitchen is fantastic with nice cabinets and appliances with a breakfast nook and laminate flooring. Inside laundry just outside the Kitchen area, The master suite comes with nice lighting, ceiling fan, large bathroom, large tub and dual vanity, separate shower, with a large walk-in closet. The other two bedrooms are located on the other side of the home with a nice bathroom next to the entry and bedrooms. The rear yard is perfect for entertaining with lots of deck space, and room for patio furniture, BBQ, and rear access for bots or RV. This home also comes with a separate private office complete with counters cabinets and two work areas. 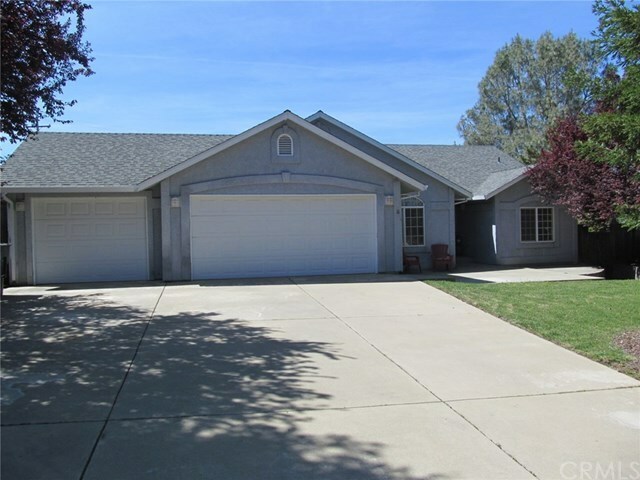 The garage has lots of storage and room for toys, this is a must see home!